You can’t just punch someone in a patisserie, you animal! (SPOILERS) I can’t say I was ever a massive Kevin Costner fan, but I appreciated his ability to fit into a certain sort of role like it was custom made for him; he had that movie star of old quality that suited a bygone era. So I took no particular relish into his descent into the realm of Bodyguards and Waterworlds and Postmen, no matter how respectably several of those performed, although Madge probably thought his box office demise was “neat”. A contemporary of Bruce Willis, both their careers began to splutter about the same time, and Costner’s in particular seemed to be over and done with by the time he reached 40. Perhaps part of that is both having a face for older roles. Costner doesn’t look a whole lot older now than he did then, particular since he is fully on board with the benefits of a decent wig maker. Like many an actor, his time out of the spotlight – most of this millennium barring the odd pleasant surprise like Open Range and Mr. Brooks – gave way to a second phase. In this case, however, his second phase derived from a supporting role in a not-especially-loved movie (Man of Steel) and has resulted in a succession of vehicles that few have cared for, whether replicating the mentor relationship (Jack Ryan: Shadow Recruit) or taking the starring role (Draft Day) or both (McFarland). The latter two saw him rekindling his flirtation with the sports pic, which did him in good stead for a spell (Field of Dreams, Bull Durham, Tin Cup) but he has also attempted to embed himself in a genre that always elicited mixed fortunes. Costner was never much of an action star. He could appear in vehicles with action in them, but they almost always required something else going on to become a success (The Untouchables, No Way Out). His pursuit of the mantle of geriatric villain buster, in a no-chance competition with reigning champ Liam Neeson, first found him teaming with the man who made Neeson in Taken, Luc Besson, for 3 Days to Kill. 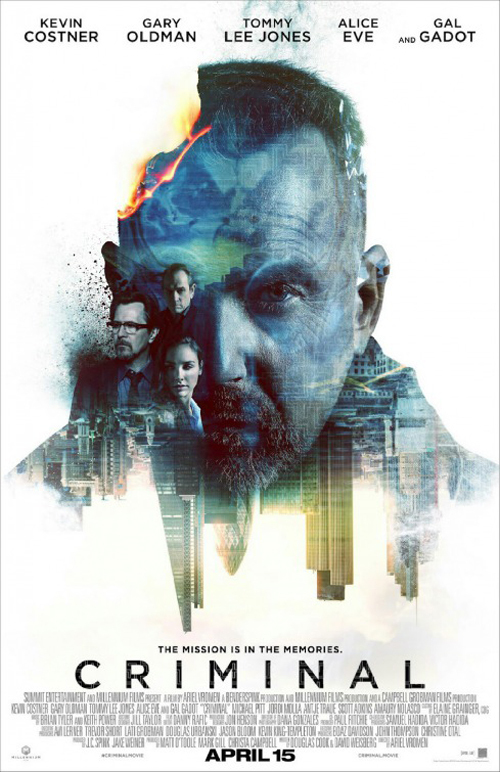 While no one was very interested, and McG’s name is considered such poison that few were even going to give it the benefit of the doubt, it’s actually a lot of fun, and Costner’s a lot of fun in it. Would that it were so true of Criminal. I mean, full marks to Douglas Cook and David Weisberg (The Rock, Double Jeopardy) for the completely barking plot. I have no idea what attracted the cast to sign on (producer Avi Lerner being persuasive, or his cheque book, is the most likely answer), or director Arial Vromen (whose last flick, The Iceman, was at least decent). Ryan Reynolds seems to have a body swap obsession (Self/less, R.I.P.D. ), so that might explain his decision to show up for a glorified cameo, before his memories get transferred into Kevin’s psychopath Bill Pope (“He doesn’t understand society, or how people are supposed to behave”) by Dr Franks (Tommy Lee Jones, looking more desiccated than ever; still, it’s nice to see him and Costner sharing a scene or two), so Kev can proceed to provide the information Reynolds had locked away in his noggin, in order to prevent even bigger psychopath Xavier Heimdahl (Jordi Molla) from buying a program that will access the globe’s nuclear defence codes from Michael Pitt (as The Dutchman – yes, he wears a vague approximation of a Dutch accent). Although, Xavier’s plan (“I’m calling for the overthrow of all governments”) doesn’t sound like such a bad idea. Costner playing a really bad guy who turns out not to be so bad after all feels like déjà vu (wasn’t that roughly Waterworld? ), and Mr. Brooks was wound up much more effectively in fashioning a tug of war between impulses. Jerico Stewart (!) may slaughter a few people, but as soon as he happens upon Reynold’s gorgeous wife (Gal Gadot) and feels a paternal pull towards his daughter (Lara Decaro), we just know he will metamorphosis into a big softy (“I wish I could keep being him”). Indeed, as absurd as this whole thing is, it’s a little alarming how far Cook and Weisberg push it, right down to a beachfront final scene suggesting Gadot is quite willing to play happy families with a murderer infested with her husband’s memories. What kind of sicko is she, exactly? The London setting gives rise to the occasional incongruous piece of dialogue (“What’s he doing coming on a fishing boat to Dagenham?”), and actors such as Alice Eve, Scott Adkins and Colin Salmon (to give it that Bond authenticity?) pop up in small roles. Gary Oldman plays an American, by the name of Quaker Wells (!!) and gives a truly dire performance laden with wretched dialogue (“Don’t give him the flash drive! He will SCORCH the Earth!”) Any movie with a special appearance by Piers Morgan is bound to have problems, and if Vromen just about keeps Criminal moving, it’s really the cast and the brazen dumbness of the plot that ensures this is half watchable. Just as well for Kev that Hidden Figures came along when it did, since it means he can now have another second shot at supporting actor acclaim.